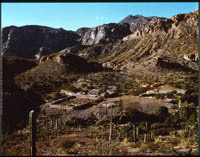 The Baja California cordillera is made up of a succession of perhaps ten geologic structures, granite at the northern and southern extremes, sedimentary capped by volcanics in central regions. The peaks of most are in the range of 5,000' to 6,500' but San Pedro Martir, in the north, rises over 10,000'. Mountain ranches occupy very diverse and usually picturesque locations. Some nestle in valleys at the base of a sierra; some occupy shelves alongside higher arroyos, others sit on intermediate or high mesas. Few are located above 3,000' because sites were determined by the availability of permanent water, which is rarely found in the barren stone of the higher uplands. Ranch economies depend on available resources. At a few dozen locations, ranchers have been able to create huertas or orchard gardens large enough to feed their immediate people and at times provide saleable or tradeable surplusses. Most lowland ranches depend on cattle for income. At higher elevations, the basis is goats. The rugged geology makes most ranch sites visually striking. Because the peninsula is so narrow, many also command views that terminate with the gulf or the Pacific. San Antonio and San Francisco, its larger neighbor, occupy different parts of a broken mesa 3000' in elevation in the Sierra de San Francisco. 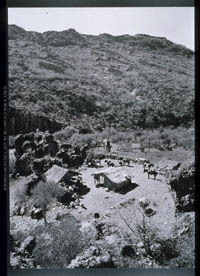 Rancho de Santa Bárbara on the eastern slope of Sierra de San Juan, 1973. Vivelejos long had the distinction of being one the ranches most remote from any sort of automobile road. Recent construction brought a road within less than ten miles but the terrain is so rugged, the remaining gap will probably be bridged on foot or animal back for a long time. 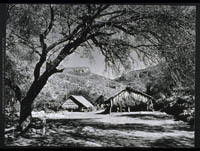 Rancho de San Dionisio in the foothills of the Sierra de la Laguna, 1972. Baja California's cape region, crossed by the Tropic of Cancer, extends southward into a meteorological and climatological zone quite different from those of other parts of the peninsula. A steep sierra rises to plateaus at 4000'-6000' and peaks over 6500'. The combination produces particularly heavy summer rains and total rainfall figures that can be a power of ten greater than the arid mid-peninsula. Ranches in the foothills are often set in a grove of trees and their people look out, at least seasonally, on verdure unknown to their peers in more northerly regions. Every ranch has a corredor, a covered but open-sided outdoor area where the family can sit in some comfort even during the hottest weather. The corredor is also the ranch's meeting place, the salon where guests are seated and regaled. When I visited, Rancho de la Soledad in the southern end of the Sierra de la Giganta was the old, permanent home of a prosperous family; it had nearby orchards and corrals. Rancho de las Calabazas was a poor goat ranch 3000' feet up in the more remote and rustic Sierra de San Francisco. Each had a corredor and offered me the remarkable peninsular hospitality. 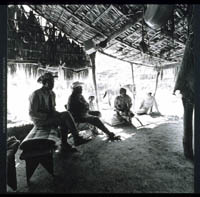 During the latter part of the 19th century and the first years of the 20th, a few prosperous Baja Californians, people who lived primarily in towns along the gulf, acquired attractive rural property always with good water supplies and often exposed to Pacific breezes. Here they built comfortable country houses to which they repaired during hot weather or whenever they felt the need for rest or change. Rancho de la Purificacion and Rancho de la Soledad are among a dozen or more attractive examples, some now in ruins, others still in use and good repair. This once-elegant cut stone ranch house was abandoned during the 1920s and subsequently reoccupied by a rancher who made the minimum repairs and additions needed to house his family. 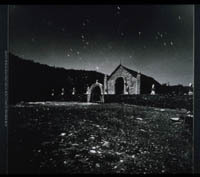 When the well-to-do owned ranches, they could add to their prestige by building private chapels at their country seats. These places of devotion were intended primarily for family and friends. Masonry was the medium for construction in all cases. Some chapels were small, suitable for only a few persons, while others, like this one built in 1899, were large enough to accommodate neighbors and employees when a priest was invited to perform a service. As the population of the mid-peninsular sierras grew, cattle- the basis of the economy-occupied all suitable pasturage. Younger sons turned to goats that could browse off the flora of steeper and higher parts of the sierras. Many ranches formed in the mid-twentieth century depended solely on goats. When the lands around those ranches became overgrazed, another step was taken. Younger families pushed into areas that had only the seasonal water found in tinajas, natural catchment basins. They took their herds of goats, milked them, and made cheese as long as possible, then withdrew to family ranches with permanent water, usually at lower elevations. The seasonal ranchers are called cambiaderos, those who move about, and the temporary homes that they build in the mountains are called cambiadero ranches. 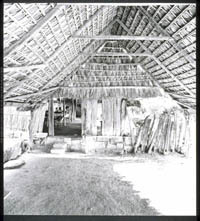 Las Jícamas is an example; its mother ranch is 200 year-old San Martín. Goats are penned near the ranchhouse at night, partly to keep track of their whereabouts, partly to protect them from mountain lions. Milking is done before dawn and the animals are released to find fodder. The goatherds, usually the family's eight-to-fourteen year-olds, and a dog round up the animals at the end of the day and return them to the pen.